In coronary artery disease (CAD), the arteries that supply blood and oxygen to your heart muscle grow hardened and narrowed. 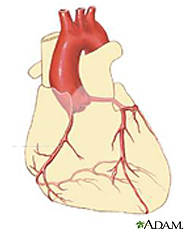 You may try treatments such as lifestyle changes, medicines, and angioplasty, a procedure to open the arteries. If these treatments don’t help, you may need coronary artery bypass surgery. The results of the surgery usually are excellent. Many people remain symptom-free for many years. You may need surgery again if blockages form in the grafted arteries or veins or in arteries that weren’t blocked before. Lifestyle changes and medicines may help prevent arteries from becoming clogged again.